New Delhi: The rural development ministry’s plans to set up a dedicated national bank for women self-help groups (SHGs) may have hit a roadblock with the finance ministry questioning the feasibility of the proposal, especially given the existence of the National Bank for Agriculture and Rural Development (Nabard). The proposed new bank is intended to promote self-employment among women living below poverty line. Rural development minister Jairam Ramesh, who took charge of the ministry in July this year, had on 18 July said the ministry would prepare a detailed paper on the subject before taking up the matter with the finance ministry. Ramesh had also mooted lowering the interest rate on the credit women SHGs receive from any nationalized bank. While crop loans are available to farmers at 4-7% interest, SHGs pay more than 9% interest on loans. 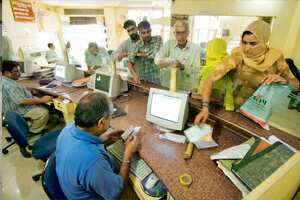 “There is no point in setting up another bank when Nabard already exists. Setting up a separate bank will require large-scale investments for infrastructure creation, especially since the bank will need to have a presence in rural areas," said a senior finance ministry official, who did not want to be identified. Nabard was set up by the government as a development bank with a mandate to ensure credit flow to agriculture and promote integrated rural development. It is the apex institution that refinances banks for onlending to critical sectors, including agriculture and rural infrastructure, and administers many funds on behalf of the government. Finance minister Pranab Mukherjee, in this year’s budget, had also announced the creation of “Women’s SHGs Development Fund" with a corpus of ₹ 500 crore, to empower women and promote SHGs. “The fund that was announced for women SHGs in the budget can be administered by Nabard," the finance ministry official said. “There is no need for another organization to dispense with the funds," he said. Ramesh, however, says he is still in talks with the finance ministry. “We are waiting for final comments from the finance ministry," Ramesh said. “We will then take up the matter with the Union cabinet." S.L. Rao, former director general of the National Council of Applied Economic Research (NCAER), says another specialized institution is not needed. “As far as lending to SHGs is concerned, the existing structure is enough particularly with the proposed Microfinance Bill. Overall, Nabard does suffice," said Rao. “For the poor, the best system is where SHGs save to create a pool and then use funds out of that for further activities. Further, commercial banks and non-banking financial companies have also started lending much larger sums of money to SHGs."